Jaguar XJ gets cleaner diesel | What Car? 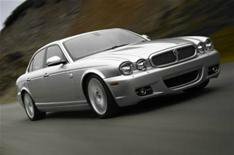 The Jaguar XJ range has been updated to include a cleaner diesel engine and more standard kit at no extra cost. The 2.7-litre diesel engine still averages 35.0mpg, but now emits 209g/km of carbon dioxide, down from 214g/km. The base Executive trim level now includes sat-nav, front and rear parking sensors, xenon headlamps and a redesigned grille as standard. Prices start from 44,599. Sovereign trim now adds 20in alloys, leather heated and cooled seats and a lambs' wool rug set as standard. Prices start from 50,472. The 4.2-litre petrol-engined XJ Super is unchanged.